Truchas is located halfway between Santa Fe and Taos on the High Road, where it straddles a ridge 8,400 feet above sea level. The colony of Truchas was established by a Spanish land grant in 1754 as an outpost. Built as a walled compound around a plaza, its purpose was to provide a buffer between other Spanish settlements and nomadic Apache and Comanche bands who often raided both Spanish villages and Indian pueblos. 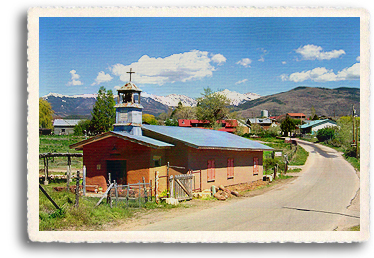 The courageous and hardy settlers of Truchas hand-dug miles of acequias (irrigation ditches) to bring water from the trout-filled river which gave the town its name (Río de las Truchas is Spanish for river of trout). Although today's residents still work their farms, many also commute to jobs in Santa Fe or Los Alamos. A few still make their living as traditional craftspeople alongside the many newcomer artists and galleries drawn to Truchas and its magnificent mountain views. The old village of Truchas is relatively unchanged, its houses and other buildings set right up against the narrow road. There are numerous traditional crafts in evidence, including weaving, wood carving, furniture making, quiltmaking and local pueblo pottery. In addition, Truchas has several galleries which feature local artwork and imported handicrafts. Truchas was a community of dirt roads until the early 1970's. Its remote location and stunning mountain scenery made it an attractive destination for artists moving to Northern New Mexico, a trend which escalated after Robert Redford filmed The Milagro Beanfield War there in 1988. A number of Truchas residents can be seen among the extras in the film. The subsequent arrival of artists altered the traditional pace of agricultural life among the original Spanish settlers, at times leading to tensions, which have more recently abated. Because the community has remained unchanged for so long, it still operates by many of the original Spanish land grant bylaws. For example, cars must share the roads with livestock, giving the livestock right-of-way. Truchas offers stunning views of the Truchas Peaks, part of the Sangre de Cristo Mountains, (nearly 5,000 feet above the community) and the Española Valley. The Truchas Peaks are a beautiful group of mountains with a true wilderness character, making them a haven for serious hikers and climbers. Unlike many of the broad, dome-shaped mountains of Northern New Mexico, the Truchas Peaks are craggy, steep mountains, quite reminiscent of their neighbors to the north in Colorado. At 13,102 feet, South Truchas Peak is the highest peak in the remote Truchas Peaks, and the second highest in New Mexico. The Truchas Peaks lie on the divide between the Rio Grande and the Pecos River in the Pecos Wilderness Area of the Santa Fe National Forest. 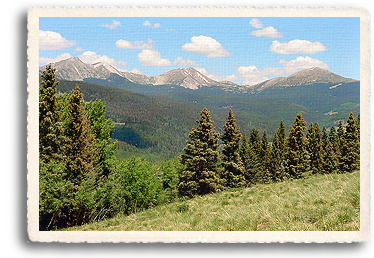 The northernmost mountain borders the Carson National Forest. In this group are found South Truchas Peak, Middle Truchas Peak, West Truchas Peak (or West Middle Truchas) and North Truchas Peak. The Truchas Peaks are difficult to reach within a single day. Many trails access the slopes of the peaks, most notably the Skyline Trail, which traverses the eastern slopes at elevation around 12,000 feet and accesses the Truchas Lakes, a set of small lakes in a cirque below the south side of North Truchas Peak. The Wild West | Taos Art Colony | Plants & Wildlife | Counterculture | Turquoise | Architecture | Features | About Us |Get Listed!